With my self-proclaimed dislike of 'self-help' books, I've never gone within 10 feet of a Chicken Soup book. Honestly, I have been too snooty to even bother finding out what these books were about. But I was drawn to this book because I am a sucker for miracles, a sucker for the supernatural, a sucker for anything that promises to be greater than my ordinary existence. I chose to read and review this book because I haven't one rational bone in my body. What I have is belief by the bucket and tears in equal measure. Tears that are all too willing to spill at the slightest tug of heart, and boy did this book tug! The book is full of small stories – personal accounts really – of faith, prayers, healing and of course, everyday miracles. I had a stray tear roll out of my eyes every other page as I read about people fighting for causes big and small, for people they held dear, and for lives that were precious. I read about many big battles that were won solely with the power of prayer, and many minor miracles that take place in our lives. The book has stories about people who mysteriously enter our lives like angels and tide us through the worst kind of troubles and strange coincidences that can only be explained as God’s benevolence. There are tales about spirits that guide us and Gods that protect us. There are simple stories and there are some unbelievable ones. There is a story about someone deriving peace and pleasure from going to a bookstore or smelling a flower. And there is another extraordinary story, called ‘Chachaji’, which has stuck with me. This one is about this guy who would have been killed in an accident, but for the timely intervention and help of his uncle (or Chachaji). His uncle is the one who takes him to the hospital and directs people to inform the guy’s parents. It is revealed later that the uncle had died the previous year! Another story (I think it was called ‘The wind carried me’) that had me sniffling was one about a child who has a miraculous escape even after falling from the terrace of three-storey building. There are several such stories about children being ill or in distress and their parents clinging to their last threads of faith and making miracles happen with the power of their faith. It put me in the shoes of those parents and made me thank God for the protection He has always given to my child. But while these tiny tales are heartwarming, they sometimes make you cringe with their style of writing. Some are so naïve, you wonder which direction the editor was looking when the story found its way within the pages of this book. Let’s face it, the Chicken Soups of the world are not read for their literary merit. 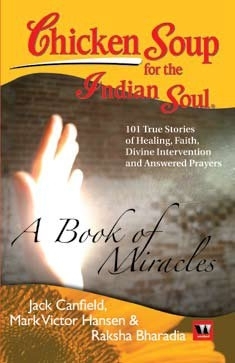 But if some suffering soul finds some hope and warmth in these words, I see no harm in serving them a bowlful of Chicken Soup for the Indian Soul – A Book of Miracles.